Welcome to Issue 348 of IBOtoolbox News! IBOtoolbox is a great place to build your sales team and IBO has made it very easy for you to do that! IBO gives you the capability to interact with other business owners worldwide, 24/7! By participating in the platform doing things you would normally do online, you have the ability to bring experienced leaders into your organization. Thank you for reading IBOtoolbox News, enjoy your newsletter! We are in the heart of the busiest time for marketers. Traffic is steadily over 300,000 visitors daily and many new members have joined us here at IBOtoolbox! We want to welcome you to our community! IBOtoolbox is a platform that will always put you first and wants you to be successful! Let's get you off and running on a fast start by completing your profile. This is your first step to unlocking many free tools for your business. IBOtoolbox rewards you with 500 credits (2500 ads) once this is completed. Make sure to click on save so your profile updates and once you have completed your profile, return to the dashboard and your credits will be issued! There are 6 optional steps you can continue with to really take advantage of what IBO has to offer! The default wall filter is "All Wall Posts". The posts displayed will be every wall post by all members. To change the filter, simply click on the down arrow to the right of "All Wall Posts"
As IBOtoolbox grows, the wall filters will become an increasingly valuable tool to utilize if they aren't already. Certain wall posts will be easier to find and will not get lost. It will also help you keep the conversation going which is going to help you build those relationships with the other members and get you more exposure! Let's break down what each filter will do. "My Wall Posts" - This filter will display all wall posts you have entered. It will also display comments that other members have left on those wall posts. Even though it will only display two comments at a time, you can always click on "more" below the last comment to display all comments. "My Associates" - This filter will display all wall posts made by the members that you are associated with. "Replies to my posts/comments" - This will display wall posts that I have made that have comments. I can tell you this tool is one of my favorites! It's a great way to keep the conversation going and not miss anything. "New Members" - This filter displays all new member posts as well as their notification post that they just signed up with IBOtoolbox. This filter is a great way to welcome new members to IBOtoolbox! "Non Associates" - This will display all the posts of the members that you are not associated with. "Press Releases" - Using this filter you will see all the recent press releases that were published making it easy not to miss anything! 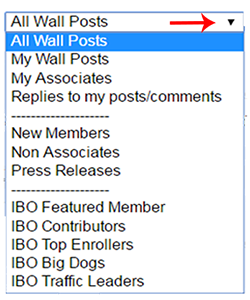 "IBO Featured Member" - This filter will display all the posts of the IBO Featured Member of the Day! This is a great way to support the selected member on their special day and learn more about them! "IBO Contributors" - Members who purchase credits to extend their advertising reach or join ClubIBO are IBO Contributors and are known as being very serious business builder. This filter will display posts by these IBO's. The next three filters will display posts from what might be considered the "movers and shakers" of IBO. "IBO Top Enrollers" - This filter displays the posts of those that really know how to recruit to IBOtoolbox. They see how valuable this platform is and they want to spread the word! "IBO Big Dogs" - This display the posts of the "advertisering leaders" at IBO. These members have the most advertising running on the platform and its family of websites. "IBO Traffic Leaders" - This filter displays the posts of the members that really know how to get traffic to their profile pages, IBOurls and their IBO invite pages. By using the wall filters, it will give you a lot of flexibility to display the posts you want to see! "news-buildyourlist" To redeem the credit code, log into IBOtoolbox, click on "Credit Center", then click "Redeem Coupon", follow the instructions within the IBO Credit Code Redeemer box to unlock the redemption tool, enter in the code, and click "redeem coupon". Credit code expires on the release of the next edition. Thank you for using IBOtoolbox! Sharing visual content is a great way to get people to remember what you are offering - that is why banner advertising is so powerful! When you see images and graphics it impacts you immediately and sometimes it can make an impact on you for months or even years! We can all agree that we like sharing great images and videos (visual content) with friends and when we do that we get a better response than just sharing text, right? Why is that? When you incorporate images and graphics into your advertising you are going to have a competitive advantage. People are 80% more likely to remember images versus 20% remember just text. But here's a big one - people comprehend 95% more of what they read if the text has images! This is why banner graphic advertising is an extremely effective way to get your offer in front of your target market. Good quality banner graphics will capture attention prompting the visitor to click on your banner ad boosting your click through rate. The huge advantage of banner graphic ads is that you can have both images and text on the banner. As marketers we must keep it simple as cluttered banner designs will underperform keeping you from getting your message to your audience. It is also important to keep your text (ad copy) concise and give the benefit(s) to drive engagement and conversions (sales). Thanks Kris, for another informative Newsletter. This has been a great refresher about how to use the resources and tools available to us at IBO. Perfect timing being that this is the start of the busy season. Hello Fellow IBOTers! This is your new business season. Please take full advantage of the IBOT training videos, family websites and advertising traffic platforms available to you; you will be so glad you did. Cheers to a successful season! !